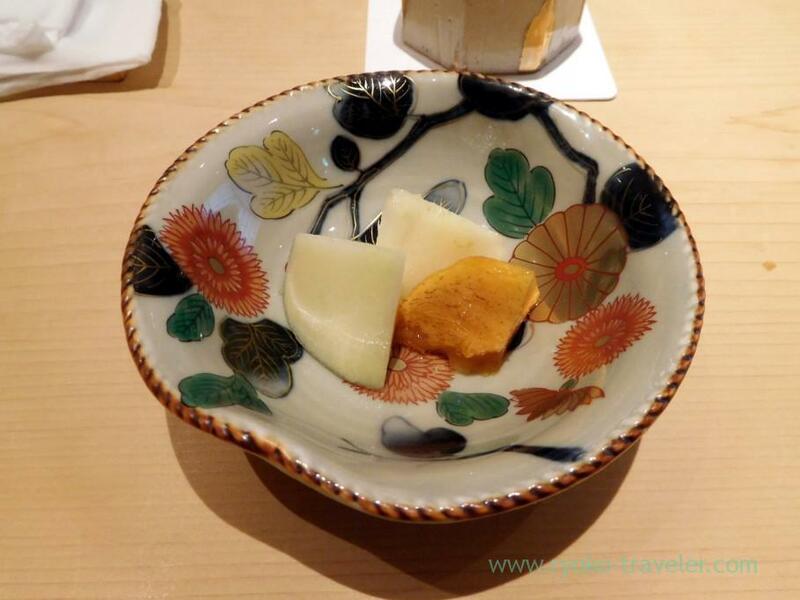 I visited a sushi restaurant named Sushi Takeuchi in Daikanyama. Sushi Sato close to this restaurant run this new restaurant. It takes close 10 minutes walk from Daikanyama station. They started their business from July 2017. 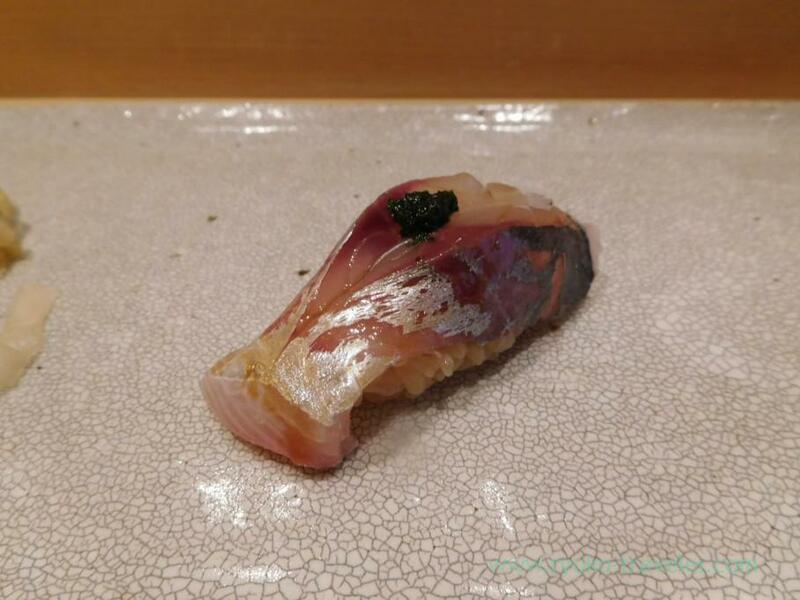 Mr. Takeuchi who is a chef and manage this restaurant worked in top quality sushi restaurant, for example, Kanesaka, Sushi Saito in Ginza and Sushi Sato. Their appearance is not outstanding. There’s no shop curtain. It looks like a hiding place. Only the small light having a word “Sushi Takeuchi” is there. When I visited there at first, I passed through in front of the door. Though the closest station is Daikanyama station, they are also close to Ebisu station and Shibuya station. Just over 10 minutes. So you’d better use the best railway. In my case, Shibuya (Hanzomon line) might be the best. There’re only 8 counter seats in the restaurant. 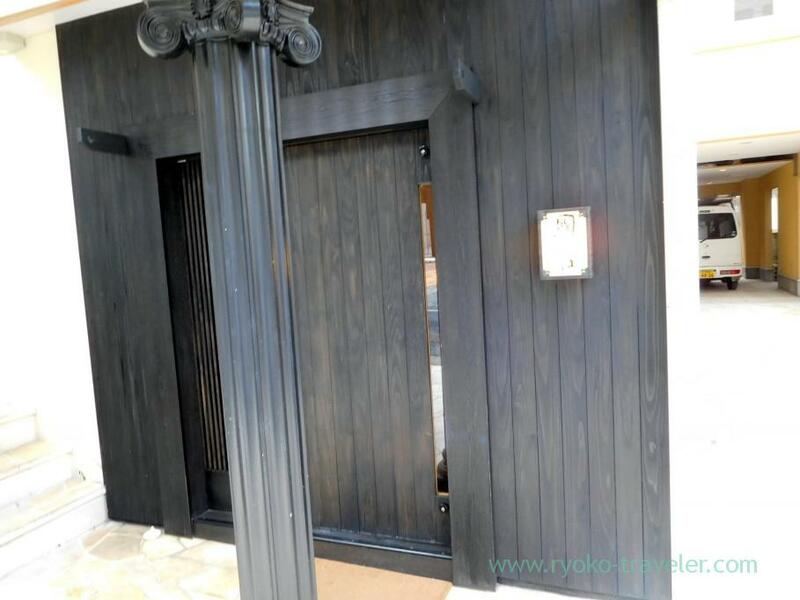 Because they are in expensive area like Daikanyama, the restaurant is small. But thanks to that, we enjoyed the chef making sushi closer. The white-wooden counter table was beautiful. Cozy atmosphere. You can reserve 18000 yen course at lunchtime, too. They accept reservation by phone only at lunchtime. But you can reserve on the internet at for dinner time. When I reserve for lunch on the phone, at first they asked me “Which course, do you want ?” and then asked me of time. And when I visited there, there were only people who reserve 4000 yen course. 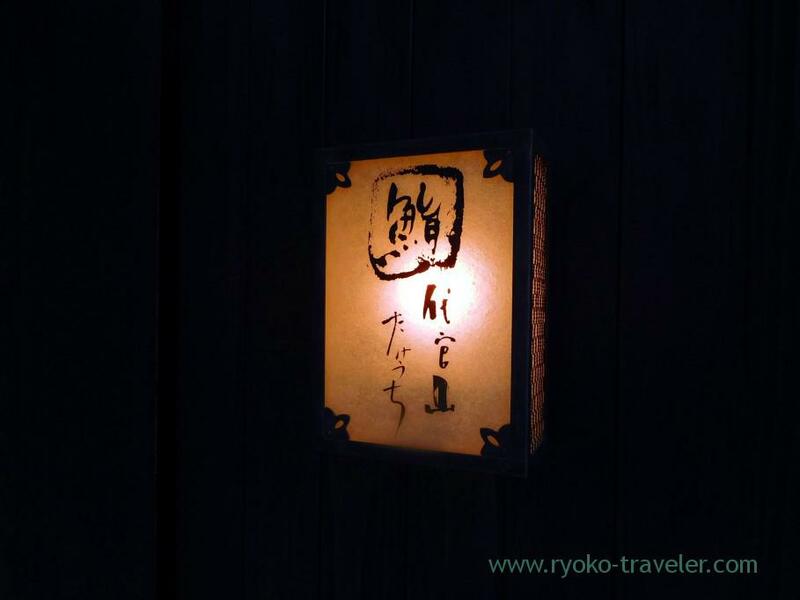 So, I think they divide guests who reserve 4000 yen or 8000 yen for serving easily. So, they don’t accept reservation on the internet. 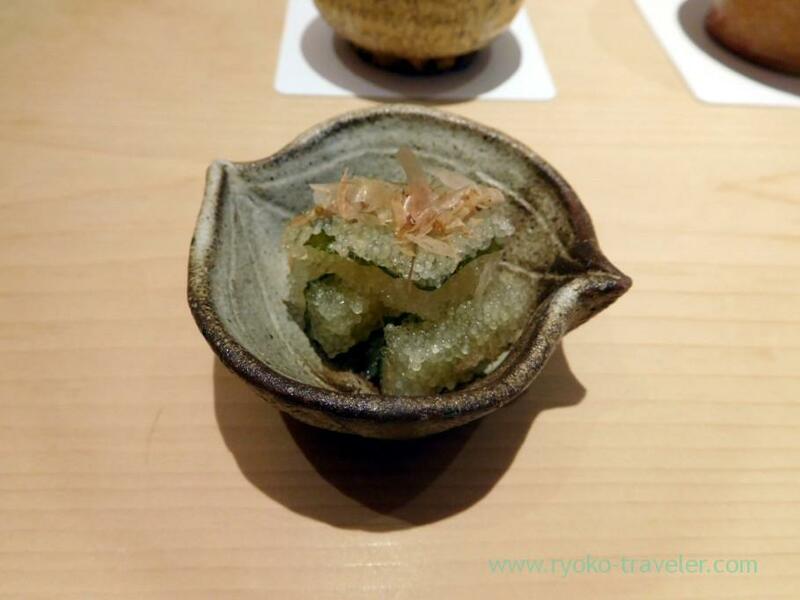 Because we visited there for the first time, we had 4000 yen course (+tax). 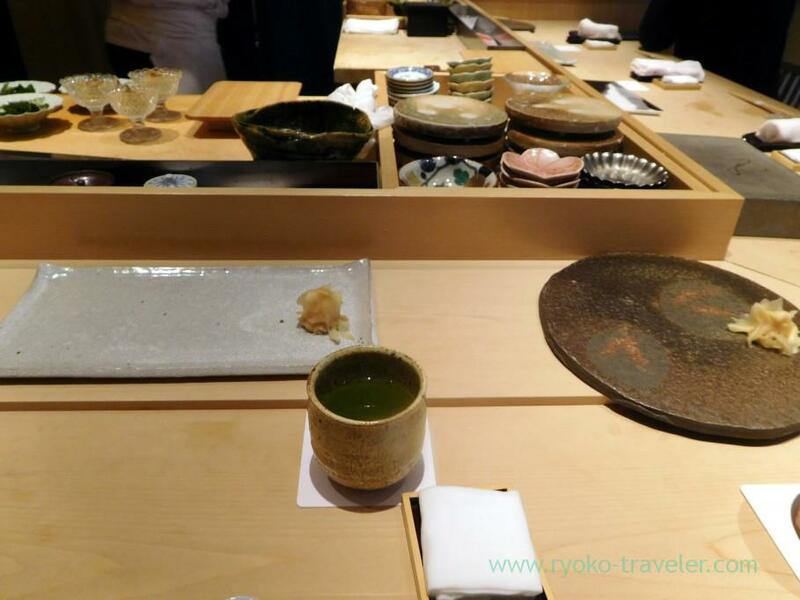 It have small dish, 10 sushi, rolled sushi, soup and dessert. First small dish was herring spawn on kelp. 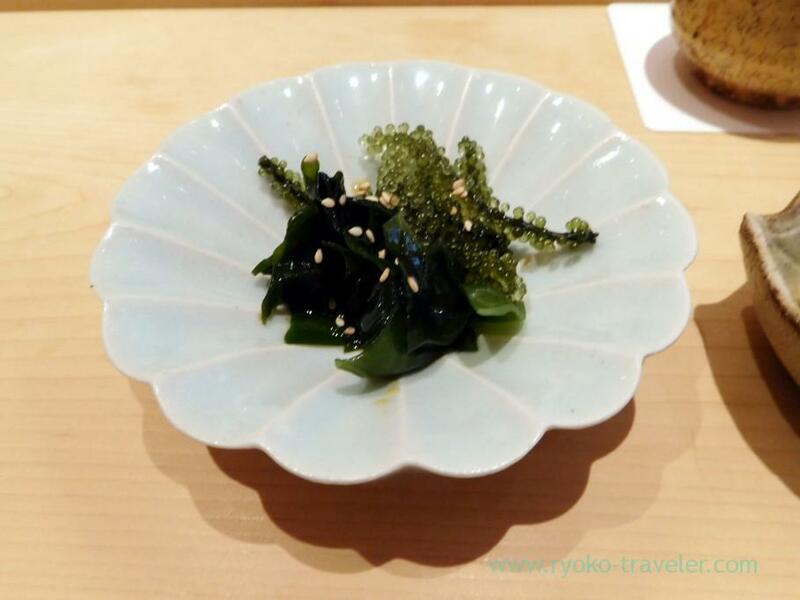 Sea grapes (green caviar). With wakame seaweed. 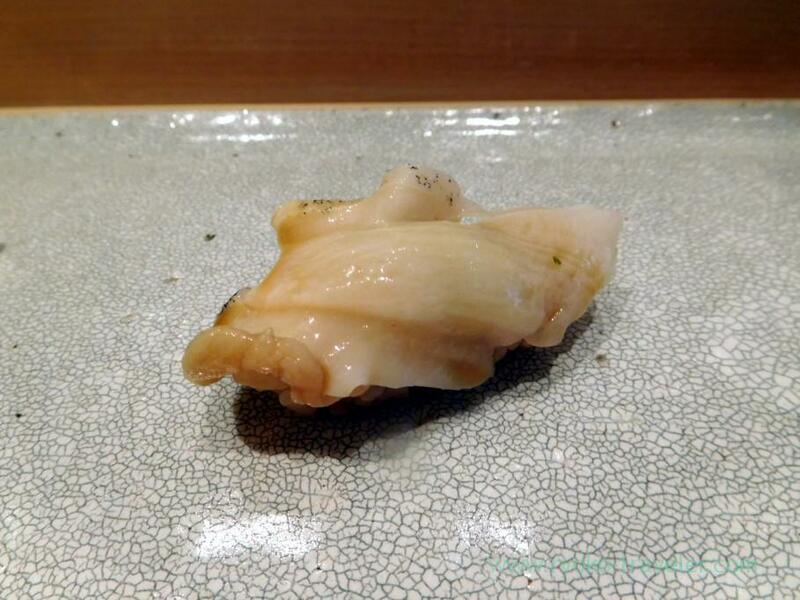 Both was seasoned with ponzu. And then sushi time started. Longtooth grouper. Vinegared rice with red vinegar. 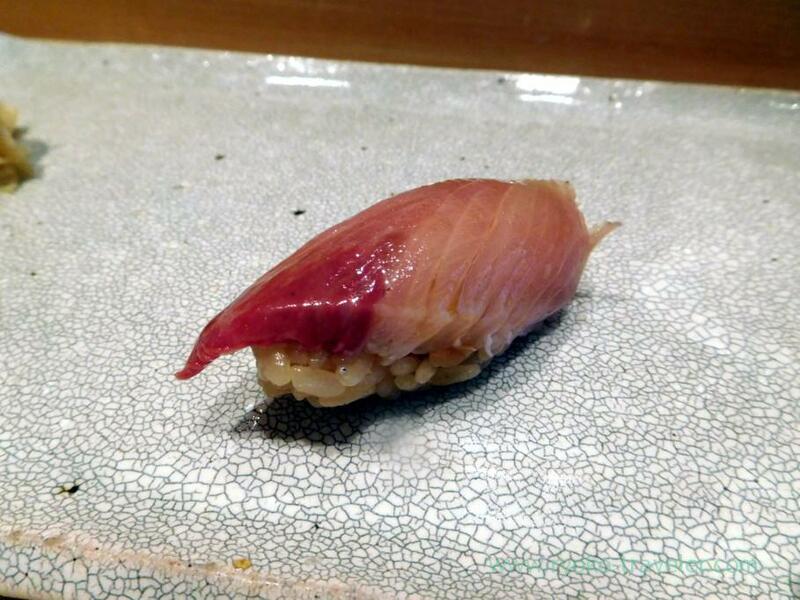 The sushi is rather small. All different dishes ! It’s good ! Yellowtail. The fat melted on my tongue. 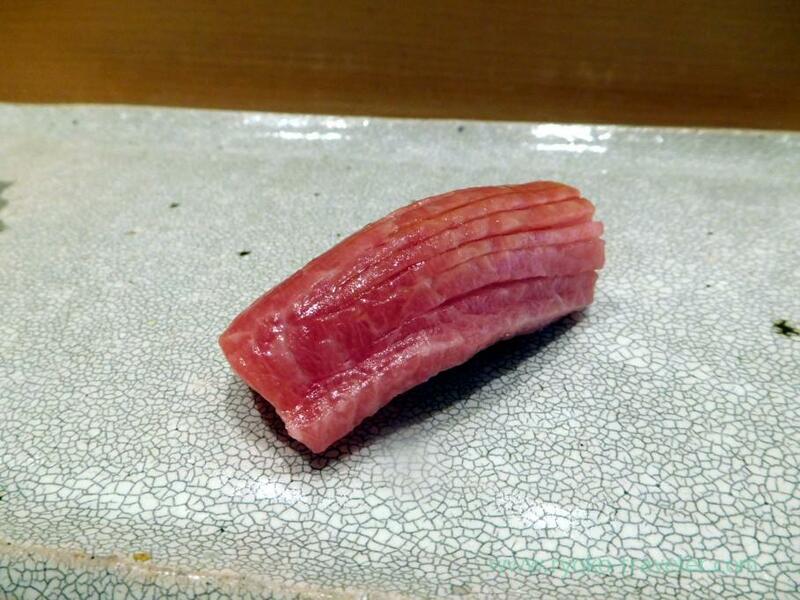 Chu-toro (fatty part of tuna). 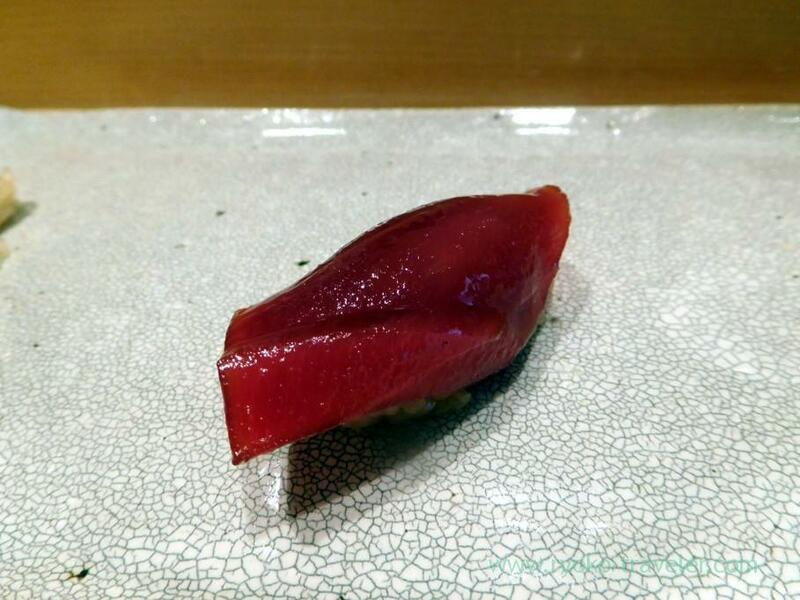 Tuna is caught in Oma (大間). It wasn’t aged. I felt it’s fresh from the texture. Horse mackerel. My delight. 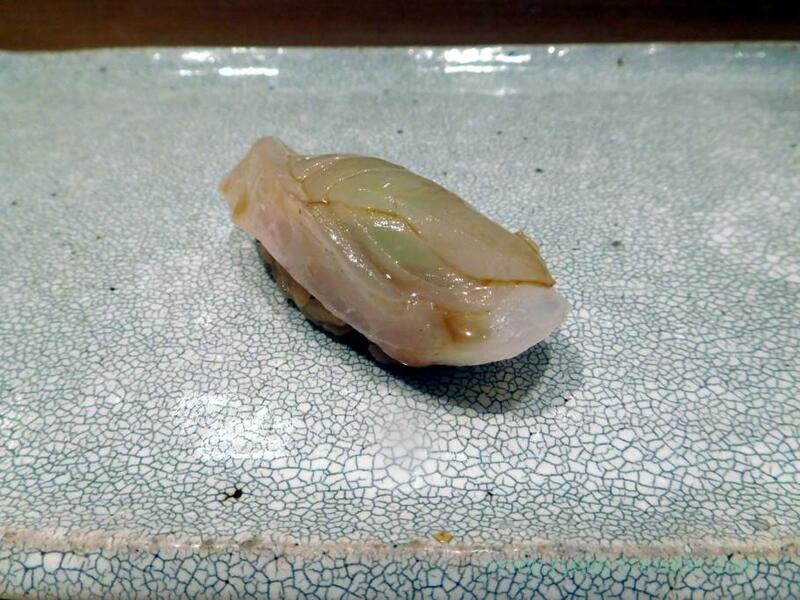 Minced chive on the horse mackerel. It tasted like garlic. 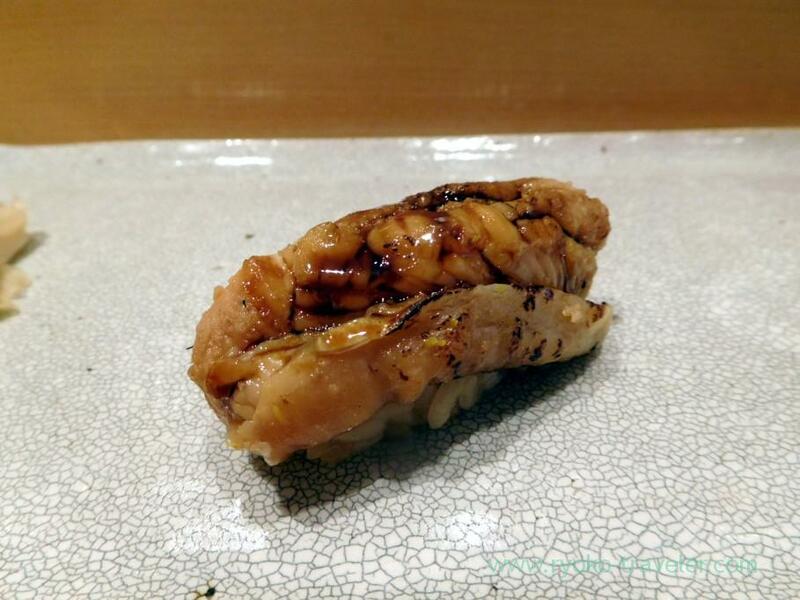 Lightly grilled blackthroat seaperch (Nodoguro). As you see, it had much fat. But it’s not greasy at all. It had light tastes. By the way, blackthroat seaperch is expensive. Whelk. Its crunchy texture was fun. Scallop. The sauce was sweeter. Though I don’t like sweet-seasoned foods, it didn’t have much source, so I felt it’s tasty. And the scallop itself was sweet. It had abundant flavor of shell. Good. Then miso soup was served. Shijimi clam was in it. I thought the course isn’t enough for me because the sushi is smaller. But it wasn’t. When I had it, I felt already full. While having miso soup, Marinated tuna was served. Last sushi. conger eel. 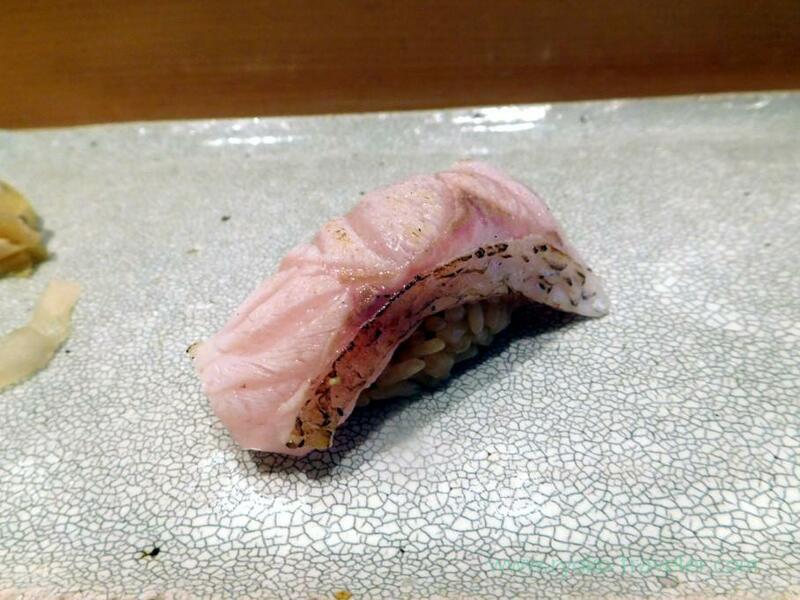 The grilled conger eel was so soft. 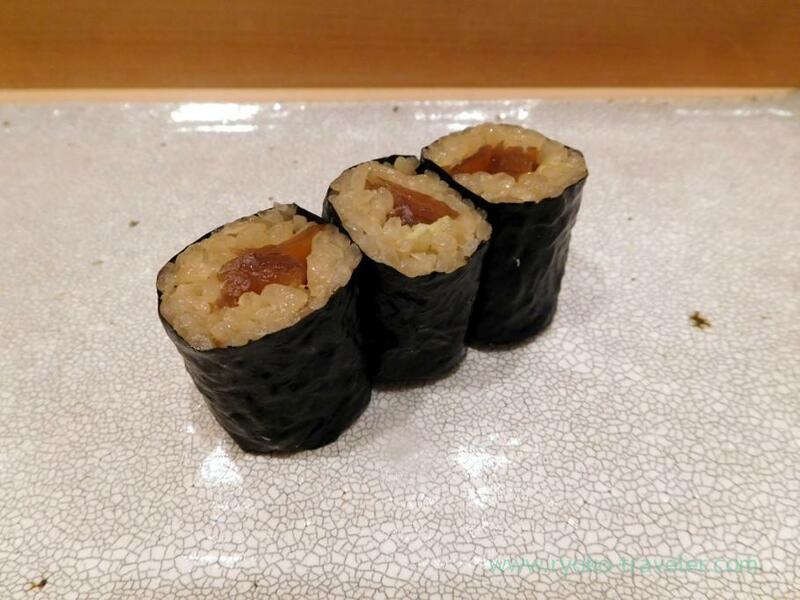 Kanpyo-maki (Sushi roll with kanpyo). Truthfully speaking, I don’t like kanpyo because it is marinated with sweet sauce. But thanks to lightly sour vinegared rice and pungent flavor of wasabi, I enjoyed it. Their vinegared rice is awesome. I was satisfied with the quality of their sushi and I have to visit there again for having 8000 yen course at lunchtime. 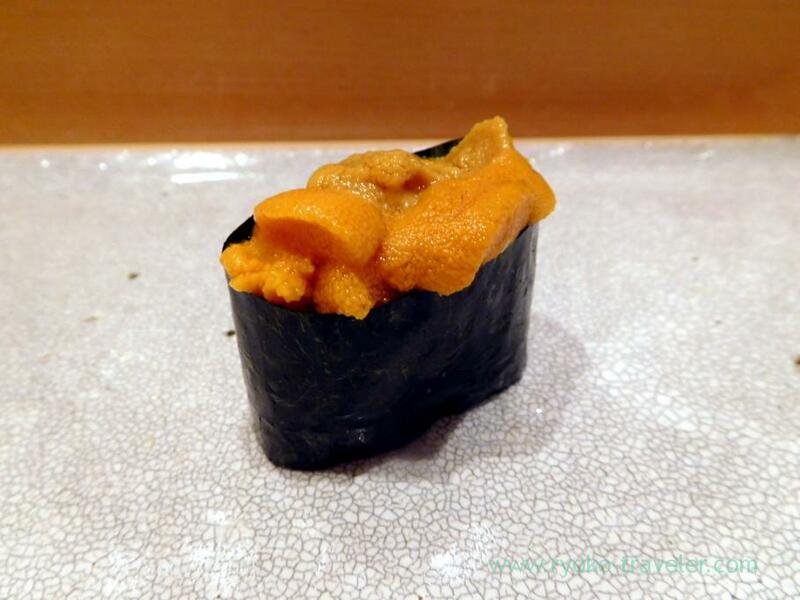 Also I want to try GARI-MAKI (rolled sushi with gari) that is their specialty ! Open / 12 p.m. – 2:30 p.m., 6 p.m. – 11 p.m.